the people than they are beneficial to the sovereign." ﻿﻿﻿﻿﻿﻿71,684 pages of Tax Code. "According to my office’s analysis of IRS data, U.S. taxpayers and businesses spend about 7.6 billion hours a year complying with the filing requirements of the Internal Revenue Code. - If tax compliance were an industry, it would be one of the largest in the United States. To consume 7.6 billion hours, such a “tax compliance industry” would require the equivalent of 3.8 million full-time workers. - Compliance costs are huge both in absolute terms and relative to the amount of tax revenue collected. Based on Bureau of Labor Statistics data on the hourly cost of an employee, my office estimates that the costs of complying with individual and corporate income tax requirements in 2006 amounted to $193 billion — or a staggering 14% of aggregate income tax receipts. - More than 80% of individual taxpayers find the process of filing tax returns so overwhelming that they pay for help. About 60% of taxpayers pay preparers to do the job, and another 22% purchase tax software to help them perform the calculations themselves. If you were to publish a book that was 500 pages long and each page was printed on both sides, the book would have 1,000 pages of reading material. This would be equal in the thickness of a ream of paper. If you had to print the Tax code you would need a set of 71 books to simply print the code, and atleast 2 completely separate books as a table of Contents. Our Crony tax system awards huge corporations like General Electric Corporation which earned $14 billion dollars, which had 5 billion dollars worth of profits to pay no taxes. From this interview, on the O'Reilly Factor Lou Dobbs says, "...And by the way, corporate America, Bill, buys, with $4 billion a year, representation that you and me and our fellow citizens can't buy in Washington. And the result is a tax system that permits GE to book its profits and leave them offshore and not, what's called repatriate, bring them back to the United States no matter where the profits are made. And that's what's happening here. They bought the loophole. They are using the loophole, and they're going to continue to do just that." There is an old Wyoming riddle, "What do you call a horse built by committee?" Answer, A Horse. The US Tax code was introduced in 1913, and was roughly around 400 pages long. In 98 years our elected officials have been busy modeling one moose after another, and we are left with 71,684 pages with 3.7 million words of loopholes and tax breaks in a mire of crony arrangements that I am certain would horrify the founders of this great nation. This chart, shows the inequality of our current tax system, according to this chart "307,868,280 Americans compose 151,285,000 tax units, 49.% of which have ZERO federal tax liability in 2009. That leaves 80,438,545to pay over one trillion collected." Currently two different popular models are being discussed as change to America's Tax Policy. 1. A Flat Tax This site from Freedomworks, touts tax reform under these "4 Basic Principals"
All Americans should be equal before the law—including the tax code. We are not. We need to Scrap the Code! And replace it with one that is simple, low, flat, fair, and honest. From the home page of this site, ..."The code is so complex because of the proliferation of deductions, credits, and other special preferences in the tax law. Because of these loopholes, taxpayers with similar incomes can pay vastly different amounts in taxes. This uneven treatment of taxpayers is fundamentally unfair and is at odds with the American value of equality under the law. The current tax code does more than complicate people’s lives during tax season and reduce living standards. It also pollutes Washington’s political culture. As special-interest provisions have been added to the tax code, Washington’s lobbying industry has flourished. It reduces incomes through punitive taxes on saving, work, and entrepreneurship. It places multiple layers of taxation on saving, thus reducing investments in new machines and technology that make American workers more efficient and competitive. High marginal tax rates (that is, the tax rate on the last dollar earned) discourage work, saving, and entrepreneurial activity, which leads to a smaller and less productive economy. By favoring certain economic activities over others, the tax code distorts financial decisions and reduces economic efficiency." 2. The Fair Tax This site from FairTax.org wants to entirely abolish the Federal income tax system and move to a national sales tax. "The FairTax proposal is a comprehensive plan to replace federal income and payroll taxes, including personal, gift, estate, capital gains, alternative minimum, Social Security/Medicare, self-employment, and corporate taxes. The FairTax proposal integrates such features as a progressive national retail sales tax, dollar-for-dollar revenue replacement, and a rebate to ensure that no American pays such federal taxes up to the poverty level. Included in the FairTax Plan is the repeal of the 16th Amendment to the Constitution. The FairTax allows Americans to keep 100 percent of their paychecks (minus any state income taxes), ends corporate taxes and compliance costs hidden in the retail cost of goods and services, and fully funds the federal government while fulfilling the promise of Social Security and Medicare." The FairTax has been called the most thoroughly researched tax reform plan in recent history. This section offers a quick introduction to the FairTax and tax reform. Scholarly research tells us that . . . This site has an overview of the pros and cons of the Fair vs Flat Tax Debate. The idea behind the fair tax is to eliminate the federal income tax and replace it with a national sales tax. There are some strong opinions on both sides of the fair tax issue so I thought I’d share a few of the pros and cons. It is not a flat tax, though I think that would be more fair than our current system as well. 1. Pro: The fair tax is much easier to understand than the current convoluted tax income tax system. When an entire industry (tax accountants) has been created to understand paying taxes, there is a problem. The picture below is Representative John Linder holding the 132 page Fair Tax Act in contrast to over 60,000 pages of U.S. tax code. 2. Con: That industry would be completely destroyed, and many jobs in the IRS would be lost. There would still be jobs to work on taking in the money, but many less than what is needed currently. 3. Pro: Transparency. Transparency in government is always a good thing. With over 60,000 pages in the current tax code, most people have no idea what is in it. What happens is the people who have more money pay accountants to find loop holes that get them out of paying taxes. Poorer people can’t afford the accountant so they just end up paying the base rate. With the fair tax it is easy to see that everyone pays the same rate on the things they buy. 4. Con: The sales tax would have to be pretty high to stay revenue neutral, i.e. bring in the same revenue for government as the current system. The bill that is currently in Congress is at 30% and independent groups have said the number is probably closer to 34%. This is a pretty large amount of money added to each thing we buy. This is especially true when you think of big ticket items. A $20,000 car suddenly cost $26,000. For somebody who has been saving under the current tax code, this would be a hard hit. 5. Pro: With a national sales tax, there would no longer be a tax on investments. This would obviously be really great for the stock market. There would be a lot of money that would come in from the sidelines and help turn the markets around. It would also encourage venture capital to invest in entrepreneurs to help fuel the American dream. Many jobs could be created with this new influx of capital. 6: Con: Along the same lines as number 4, the large sales tax would discourage people from buying things. Our economy is very heavily dependent on consumers, and a large sales tax would probably make some people spend less on things, save more, and pay off debt. Now, personally I would take almost all of that as a pro. In the long term it would be a benefit, with more people out of debt they could really stimulate the economy as opposed to spending money they don’t have which got us into the current mess. However, in the short term reducing consumer spending could have some impact, and this is an argument anyone against the fair tax will probably give. 7: Pro: The fair tax would hopefully increase productivity in our country. Currently, we have an income tax that gets progressively more burdensome the more money you make. This reduces the incentive to work harder and be productive the higher you move up the ladder. Taxing consumption makes a lot more sense than taxing production. Under the FairTax, family households of lawful U.S. residents would receive a “Family Consumption Allowance” (FCA) based on family size (regardless of income) that is equal to the estimated total FairTax paid on poverty level spending according to the poverty guidelines published by the U.S. Department of Health and Human Services … Opponents of the plan criticize this tax rebate due to its costs. Economists at the Beacon Hill Institute estimated the overall rebate cost to be $489 billion (assuming 100 percent participation). In addition, economist Bruce Bartlett has argued that the rebate would create a large opportunity for fraud, treats children disparately, and would constitute a welfare payment regardless of need. 9. Pro: A huge pro of the fair tax is it would significantly broaden the tax base. Illegal activity (such as selling drugs) that creates large amounts of income would now get taxed. Under the current system we just get lots of rich drug dealers. Under this system they now get taxed every time they buy something. Along the same lines, this would also tax illegal immigrants. This would go a long way towards solving the illegal immigration problem. 10. Pro: Opponents of the fair tax claim it could create an underground economy of people trying to evade taxes. Under a sales tax, intermediate goods that are a part of production would not be taxed. This creates potential for businesses to claim something is an intermediate good when really it is the end product that should be taxed. This would however constitute evasion and the bookkeeping that would be mandated for businesses should prevent most of this. Overall I think the pros significantly outweigh the cons for the fair tax. I think the idea of taxing consumption instead of production makes a lot of sense, and taxing illegal activities and illegal immigrants sounds great to me. However, nothing here can solve the real problem that we have. The thing that needs changed is the out of control spending habits of our government. Until that is curbed, how we pay taxes isn’t the big issue. What is most troubling to me is currently those who pay no taxes, and the unfair burden the top 50% of of wage earners who pay 96.3% of the taxes. I believe that even the poorest should pay a 1% tax. No one appreciates or values what is free. My concern with regards to the Fair Tax (unless I am missing the minutia) is murkiness of the breaks those who are truly at the poverty level would have to pay, when money for food and lodging is sparse. What I do like about the Fair Tax is that it entirely eliminates the IRS. In full disclosure I am more in favor of a flat tax. This site from Heritage (and yes the link is 10 years old) raises issues that are as valid today as when the article was originally written. 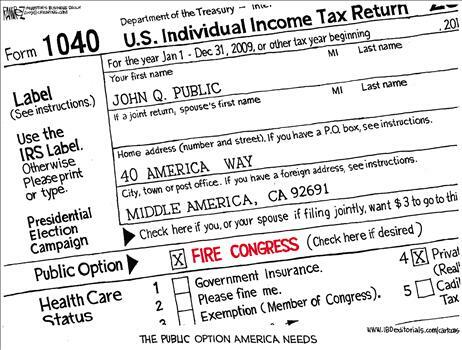 ..."The current tax code of the United States is irreversibly broken and should be repealed. The tax laws undermine the country's prosperity by imposing needlessly harsh penalties on work, savings, and investment. Although many taxpayers face confiscatory tax rates and often are forced to pay more than one layer of tax on their income, the politically well-connected can take advantage of special deductions, credits, preferences, shelters, and loopholes to minimize their own tax liability. The result of this double standard is a tax system that not only penalizes productive behavior, but also violates the fundamental constitutional principle of equal treatment under the law." Either system would be a vast improvement over our current Tax codes.